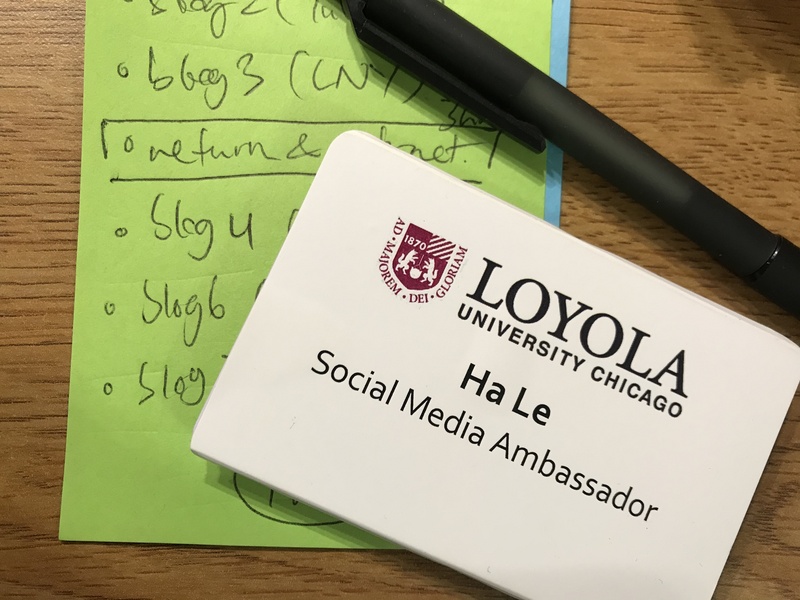 After several weeks of battling new schedules and the polar vortex, the Social Media Student Ambassadors of Loyola University Chicago and their fearless leader, Adam, congregated in the Undergraduate Admissions Office to examine the blueprints of Spring 2019. It was really nice to see everyone again although not all of us were able to be present. However, I was glad that at least one from each of our three focuses (comm flow, photography and bloggers) were able to make it. An agenda was pre-set by Adam and we began to review last semester’s work and future goals. Okay this all sounds super serious but honestly, every talk with this bunch is a good time. We ran through everything from our photo quality to the potential introduction of Loyola memes (yes you heard that right, I’m screaming too.) Very positive, productive and overall passionate vibes floated around the room and well, I love my job. I love being in such a creative space. I love being around such a motivated and ambitious people. I love how we build from each review and suggestion and want to take our work to even greater heights. And gosh I’m just to excited for what’s to come. Our blog space is being updated very soon and we’ll also possibly be given direct access to Loyola’s Instagram. The goal is to create a ‘a day in a life of’ themed Instagram stories series as well as give prospective and current Loyola students an even more up close insight of the lives of us Ramblers. Adam has also been enjoying my video work (ahhhh) and is planning to expand the project into an official Undergraduate Admissions YouTube channel with other Ambassadors also jumping on and creating their own videos. I can’t wait to create more content and see where all these blueprints take us. STAY TUNED!!! What’s the Story – of Emmett Till?